I could not use it once I purchased things from other companies So I purchased the same Mitutoyo's product as I had used before I was broken and had my replacement There is no problem with replacement goods at all. This review is about item#87148196. Calipers are always this. With reliable accuracy, I have patronized for many years. This review is about item#87148144. I am using it for inspection work of delivered items. The performance is correct, but I feel it a little larger than 150 mm. Because the case is big and heavy, I will hesitate to take it on business. It is helpful to have a small case for carrying. I bought it to measure a small product. It's easy to measure with just good size. Also, it is helpful to have a thin depth bar. This review is about item#87148135. When I purchased and used the same kind before about 15 years ago, the electrical display section broke down, such as an error indication on the digital display section. While choosing the next purchased item, I thought that this series is only familiar with high precision, so I just purchased it without hesitation. It is lightweight than the previous one and displayable letter is also large and easy to use product, and I am extremely satisfied. Very good overall feeling of operation feeling. Speaking of difficulty, the cover is poor, it is better to have cushioning material at least in the storage part. I purchased this product for the first time. I think that accuracy is also good. I'm glad I bought it. Mitsutoyo made with peace of mind. There is only a high price. There is no dissatisfaction. This review is about item#87148117. After all the calipers are easy to use Mitutoyo. High is good only. The measured value is reliable. It is smooth and easy to measure, not tiring. Batteries also last a long time. This review is about item#87148126. This review is about item#87148214. As expected it is solid. The digital display is also large and easy to see. It is a bit of a move, but will it become better if you use it? It is used for quality assurance inspection of molded parts and it is optimum for quality control because it has high accuracy. 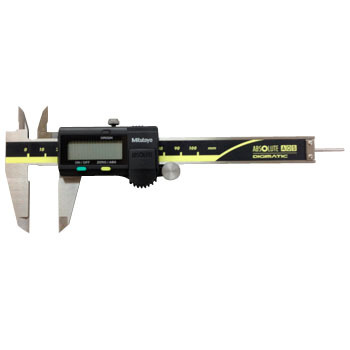 Mainly measure thickness of acrylic etc. In any case, trust in Mitutoyo is zero as it is possible to use zero with no stress. I first bought a thing with a measuring range of 100 mm, but when the object to be measured exceeds the size of 30 mm, the total length was short and it was difficult to hold, eventually purchasing 150 mm. It is used for parts processing etc. Unlike the former digital, ABS comes with it, so you can use it without worry because you do not need zero point calibration.